Five year old Kobuk is ruggedly handsome with an aloof independent side. He has been with Home Fur Good since January after being discovered at county. Kobuk is listed as an English Sheepdog mix weighing in at 68 pounds. Kobuk is people selective, however, once you enter his circle of trust, he will be the bestest friend you could ever have. Kobuk likes to lean on his people for their attention and affection. He loves toys, especially those he steals away from other dogs. Kobuk has a very playful side, but with the stress and activity of the shelter he does not let his guard down often enough to show it to everyone. With time and a little patience Kobuk will show you his inner puppy ready to romp and goof around. 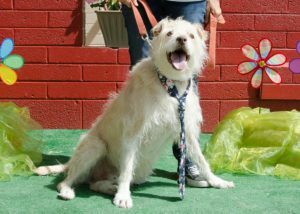 You can visit Kobuk, Thursday, Friday and Saturday at Home Fur Good, located at 10220 N 32nd Street in Phoenix. You can contact the shelter at info@homefurgood.org or by calling 602-971-1334. Is it like 2006 all over again? “The local press has been headlining that sales prices for homes in Maricopa County have hit an all-time high. This is a very misleading statement that I take strong issue with. Although the median sales price has recovered to 2006 levels, the conclusion that sales prices in general are higher than June 2006 is completely wrong. There are very few homes that would sell in 2018 for more than they would have sold for in 2006. The vast majority of homes in the valley have not recovered the value they had in 2006 and are still quite a long way from doing so. 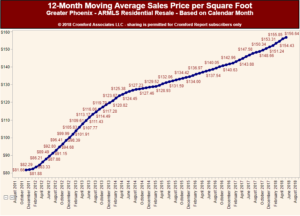 If home sellers believe they can sell their home for more than it was worth in June 2006, they are going to be bitterly disappointed, unless they live in the heart of Arcadia or a few isolated parts of South or Central Scottsdale. These media stories make life hard for agents trying to set reasonable asking prices when taking new listings. We can see that the sales mix is very different between June 2006 and May 2018. In June 2006 we had twice as many new homes as in May 2018 and the average homes size in 2018 is over 9% larger than in 2006. The average price per sq. ft. is much lower in 2018 than 2006. A second problem is that affidavits of value are woefully inaccurate about property types. Hundreds of townhomes and condos are mis-classified as single-family properties every month. Therefore any numbers quoted for single-family homes in May are likely to be wrong until the affidavits have been checked and corrected, which takes several weeks. In general, median sales prices are often misused and should NEVER be the basis for comparing the values of homes or comparing new home prices with re-sale prices. A much more reasonable measurement is average price per sq. ft. which, though not perfect, adjusts for the difference in the average home size. In June 2006 the average price per sq. ft. of single-family homes sold in Maricopa County through the MLS was $193.65 while the average for May 2018 was $170.02. We therefore estimate that the average single-family home in Maricopa County has a 14% rise in price to achieve before it reaches its value in June 2006. Individual homes will obviously vary quite a bit. So we accept his missive to not let our clients be misled and hope this article helps to that end. The 14% mentioned above is an average and every neighborhood has its own “number”. As always, we are happy to answer any of your concerns or questions about your specific neighborhood.